Tony Langley and the crew of the British flagged Gladiator proved that even though they have made technical changes to improve the all-round performance of their boat in stronger winds they still have the pace to win in very light winds when they ghosted to victory in today’s practice race which is the prelude to the Gaastra 52 World Championships which start Tuesday off Miami Beach, Florida. 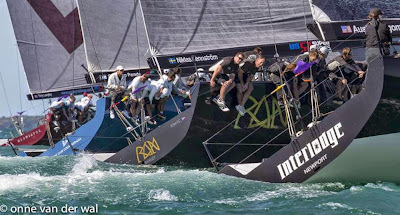 The eight teams competing are fully expecting Miami to deliver a broad range of wind conditions over the five scheduled days of racing but they will be hoping that the breezes have a little more punch and are more settled in direction than today’s offering. 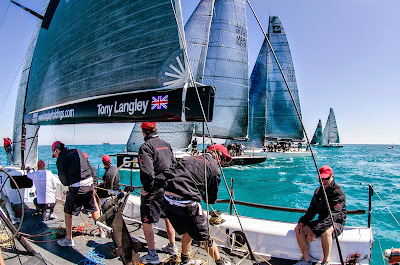 Langley’s crew, with Chris Larson calling tactics, were quickest off the start line, knitting together the patchy breeze to build a very big early lead. Defending 52 SUPER SERIES champions Azzurra crossed the finish line second with the Austin and Gwen Fragomen’s quietly consistent Interlodge – runners up in Key West last month chasing Azzurra to finish third. The eight boat Gaastra 52 World Championship fleet is split evenly with four from the USA and four from Europe. Newcomers to the fleet since Quantum Key West 2013’s 52 SUPER SERIES are Jim Swartz’s USA based Vesper which has Gavin Brady on tactics and the Dutch all-star team on Gaastra which is skippered by Finn and Star sailor Marc Blees. Both 52’s showed good form at times today and during informal practice have been up with the established crews. “Things are going well. We are going better in the breeze but when it is light and crazy light today then anything can happen. I am superstitious about a lot of things but winning the practice race is not one of them. Winning the practice race has always been a good omen for me.” Larson concludes. “I think we will see everything this week. That should be the most extreme light we will see but the forecast shows a bit of everything.” Also affirms Adrian Stead, the tactician of Rán Racing who has won the world title twice as tactician with Quantum Racing. One particular feature of the 52 World Championship is that it is strictly owner-driver, perhaps giving a small advantage to those owners who steer regularly through their season – like Langley, Rán Racing’s Niklas Zennström, Fragomen on Interlodge and Jim Swartz on Vesper. 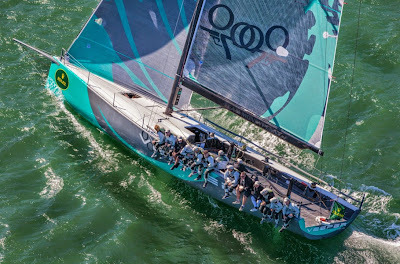 Doug De Vos steered Quantum Racing in Key West whilst Alberto Roemmers JR has had a longer break since he last steered Azzurra, but showed no sign of that when he brought the blue hulled 52 home second today. The Gaastra 52 World Championships are complemented by the HPR 40 class Midwinter Championship. The HPR entries are not defined tightly by a box rule, but can range in size and style, relying on the new HPR rating system to equalize them under handicap. 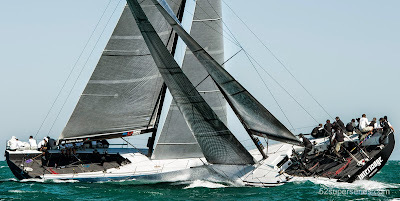 HPR was devised to fairly rate high-performance, offshore-capable boats. There are two design types on show here the Carkeek 40 and the Farr 400 with two of each – Stephen Murray’s New Orleans-based team on Decision won the HPR class in Key West along with Steve and Heidi Benjamin’s Spookie which is the newest boat in the fleet. George Collins’s Chessie Racing finished as the top Farr 400 in Key West, and so may be considered a strong favorite here in Miami but will have strong competition from Team Premier lead by Dee Smith.